Philadelphia 76ers center Joel Embiid twists his leg while defending against LA Clippers guard Tyrone Wallace during the fourth quarter at Wells Fargo Center. 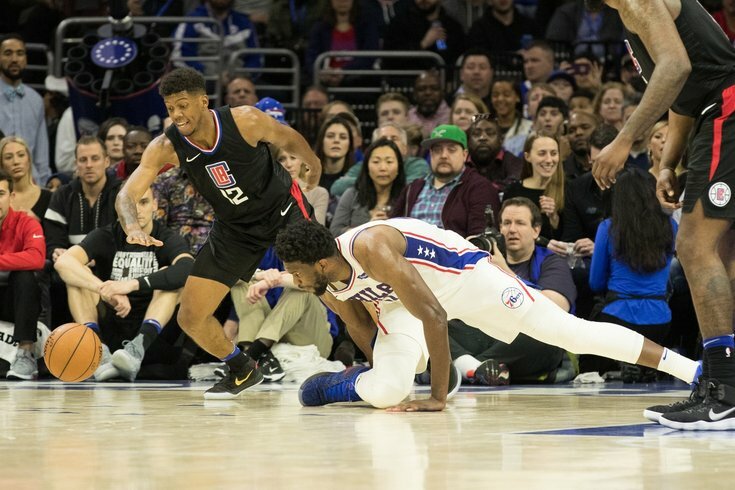 In the immediate aftermath of Philadelphia's 112-98 victory over the Los Angeles Clippers, it was a little difficult to focus on what the result meant for the team. The Sixers snagged an important win in a game that got a little hairy down the stretch, but that played second fiddle to the big man on campus. Joel Embiid took an awkward spill midway through the fourth quarter, in a moment that sucked the air out of the Wells Fargo Center. The building was pretty live for a rainy Saturday night in February, but when you watch a big man with an injury history go down like this, blood pressures rise real quick. Embiid exits the game after slipping. After spending some time on the ground and hobbling over to the bench, Embiid made his way to the locker room and disappeared from sight momentarily. Heavy emphasis on momentarily, because after coming out of the game at the 7:33 mark following the tumble, he was back in with 4:53, less than three minutes of game time and probably no more than 10 minutes of real time later. Following the game, Brett Brown didn't have a whole lot to say about what happened or the decision to put him back on the floor, saying simply that he trusted the medical staff's word when they cleared him to return. It's easy to use the medical staff as a punching bag, but this is one instance where it seems like the process left a lot to be desired. Had this been one freak spill on the court Embiid bounced back from, okay, play on after getting a quick checkup. But that was decidedly not the case, and most of us on press row were shocked Embiid was sent back in given the broader context of his night. At the end of the third quarter, Embiid made an absolutely insane closeout to try to block a late three-point attempt by Austin Rivers. It's the sort of effort and enthusiasm for the game that turned him into an elite talent to begin with, but watching him colliding with the bench is never a pretty sight. Almost immediately after the fourth quarter started, Embiid found himself on the ground again, this time in a little more innocuous fashion. As he attempted to contain a driving Danilo Gallinari, he lost his footing and hit the ground. He shook it off rather quickly and kept playing, but he flexed his ankle a few times and looked to be showing signs of fatigue. What doesn't always come across in a broadcast that did in person was Embiid's level of fatigue. For most of that stretch during the beginning of the fourth quarter, he looked a lot more fatigued than he has in recent weeks, both in his movement speed and general body language. He short-rimmed a jumper from 15 feet away about 45 seconds before he had his final spill, something he almost never does from that range. When you combine that with a troublesome ankle that left him a game-time decision for the second night in a row and a trio of spills in a short timeframe, you would think a little more caution would be warranted. These games prior to the All-Star break are valuable to the Sixers, but none are anywhere near as valuable as Embiid's future. Fatigue has long since been proven as a primary cause in major injuries, with the loss of stability and coordination taking some of the body's natural defenses against injury away. Pre-existing soreness — which on its own is fine to play through — can become a lot more insidious in this light, as the body tends to overcompensate for injuries and ailments and ends up exposing other parts of the body to catastrophe. This isn't to say that playing Embiid in the final minutes of Saturday night was a guarantee of any major injury, but that the process involved was lackluster. A lot of fans appeared to suggest Embiid looked just fine when he returned to the floor, and on some level he did. But he looked just fine in his rookie year against the Rockets, and we know now that playing him with a torn meniscus was a negligent, insane move from the Sixers. Embiid played more than well enough to close out the game, but it seemed pretty clear he didn't have the legs on the second night of a back-to-back. One sequence, in particular, stuck out: the Clippers got two consecutive offensive rebounds on one possession, and Embiid just sort of meandered behind Gallinari when he drove to the hoop on the final shot of the possession. That's not Embiid, as you can see in plays like the one where he flew into the bench. He is not a passenger on defense, nor is he the type of guy to let rebounds aimlessly drift through his airspace. Embiid is an attacker in every sense of the word, and watching him let the Clippers pass him by was a major tell. There are two ideas that are important to separate here. I think playing Embiid with the ankle soreness the last couple games, particularly in the back-to-back scenario tonight, is a good learning experience for him. He and the medical staff learn a little more about his pain tolerance and threshold, and the Sixers begin to build more continuity with their rotation. Those things matter and ultimately make Embiid and the team better in the long-run. But given the history here, it's hard to believe they wouldn't err on the side of caution in a scenario like this, in the midst of the second back-to-back he has ever played in. When Embiid hyper-extended his knee against the Portland Trailblazers last fall, most people remember that he did not finish out the game after a painful landing. What some have forgotten is that the Sixers put him right back out there in the beginning of the fourth quarter, after taking the spill midway through the third quarter, before finally coming out with 8:50 left for "precautionary reasons." We would later find out Embiid was carrying a torn meniscus, which the team allowed him to play with against the Houston Rockets on national television. So while it was great to hear Embiid joke with the media after the game Saturday that we should stop asking him about the knee — "Can we just stop talking about my knee? I'm fine." — there's no real reason to suggest how they've handled Embiid's in-game pain and injury management is beyond criticism. Keep in mind, this is the same group that gave the green light on Embiid playing nearly 50 minutes in a triple-overtime game this season, which ultimately caused him to miss time in the weeks following the game. And if you took him at his word following the Portland game last season, he was just fine, too. This line is a hard one to walk, with Brown trying to maximize wins and the medical staff attempting to maintain a level of trust with their star player. They can't coddle him or pull back too hard at the risk of making him feel disconnected from the decision-making process, but they also can't just throw caution to the wind and send him back out because his competitive spirit dictates it. This is not about putting him in bubble wrap or expecting him to be at 100 percent every time he's on the court. It's about everyone involved understanding the gravity of exposing him to possible issues in a February game against a team the Sixers can and should win without him. He will never play back-to-backs in a playoff setting, and thus the Sixers will never have to "prove" he can do this so long as they keep him healthy and productive enough to get the team to the postseason to begin with. There were a ton of great storylines in this game. TJ McConnell had one of his best games since the calendar turned to 2018. Justin Anderson is giving the Sixers some nice punch off the bench. JJ Redick got it going from deep when the Sixers desperately needed it and did so against his former team. None of that matters if Embiid goes down. The team is not built to withstand his absence, and they can hardly manage when he has to hit the bench in games where he plays 30+ minutes. Knowing that, the Sixers ought to err on the side of caution, which they love to stress between games and often find themselves unable to do once the bright lights turn on.